Now that I've figured out how to make the triangles to fill in the sides of the afghan I needed to decide what I wanted to do with the corners. As you can see, they aren't squared up. I could have left the corners the way they were. There's nothing wrong with a rounded corner except that they aren't what I wanted. So, next, I had to figure out how to make a small triangle. I tried out a few methods, with more stitches, less stitches, center double decrease - none of these were pleasing to the eye or didn't lie nice and flat. Finally, I hit on the right combination of techniques. Here's what I did, keeping in mind that my base number has been 31, so yours might differ. For this piece, you'll need an odd number of stitches. With the right side facing pick up and knit 15 stitches. Row 1 (wrong side): Sl 1 purlwise, knit to the last st, k1 tbl. Row 2: Sl 1 purlwise, (sl 1 knitwise, k1, psso), knit to the last 3 sts, k2tog, k1 tbl. Repeat these two rows until you have 5 sts remaining, ending after a wrong side row. Next row (right side): (Sl 1 knitwise, k1, psso), k1, k2 tog. Next row: K3tog. Fasten off. And there you have it, a small corner triangle. 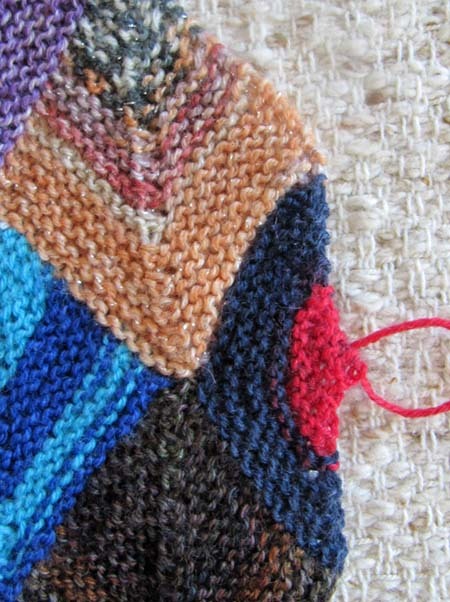 The corner triangles and the ones between the Vs work up very quickly and use very little yarn. I'll have these done in short order, I'm sure. After that, the next thing I'll have to think about is the edge and how do I want to finish it. Again, don't forget our "deal" from yesterday's post! 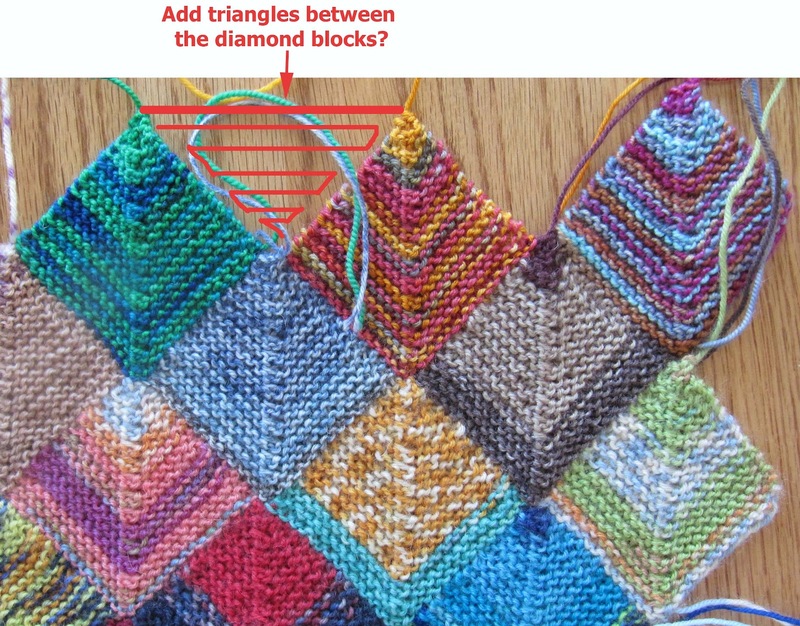 In Tuesday's post I talked about the possibility of adding triangles between the Vs on my sock yarn afghan. 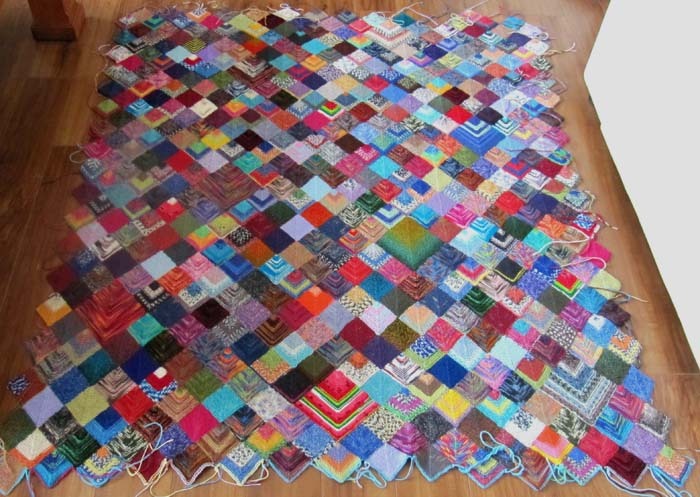 The purpose of them was to make my afghan into a rectangular shape with straight edges. I tried a few experiments and was not happy with my results, but persisted. I figured out that I would have to decrease 4 stitches on every other row to make a triangle. If you look at all the diamond-shaped blocks you'll see a line in the center of each where the double decrease was worked. I was hoping to keep that line in the triangles to make it consistent, but it wasn't working out. I did some research online and found that others weren't totally happy with their attempts either. Next, I thought I'd make the triangle with no center line at all, working the decreases on the edges. 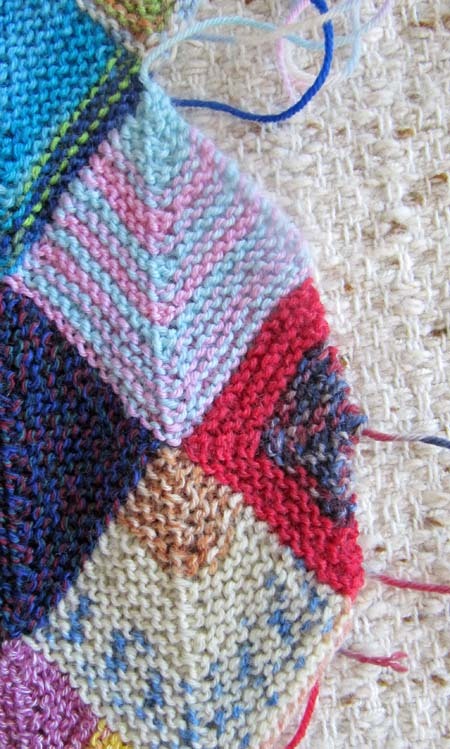 This triangle is on the right-hand side of my afghan and, as you can see, it doesn't look very nice. While the outer edge is straight, the block is more of a U-shape rather than a V. I scrapped that idea. It became clear to me that I was going to have to maintain the center double decrease. I thought about the fact that the decrease line on the diamonds was going to be vertical, but the decrease lines on the right and left side edges were going to be horizontal. The more I thought about it, the more I realized that I was really okay with it. In fact, I more than okay with it, I actually liked the fact that all the decrease lines in all the triangles would be pointing towards the edge of the afghan. I was also very happy with the sharp V-shaped edges. As for the triangles at the top and bottom, there was no problem at all. They are vertical, like the rest of the blocks, and, they also point towards to outer edge of the afghan. 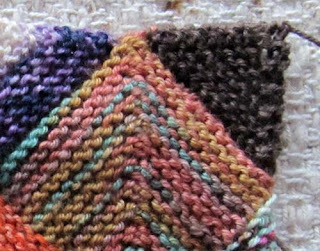 Now I have 10 triangles worked on one of sides (so far) and I have a nice straight edge to my afghan. I couldn't be more pleased. Here's what I ended up doing, and will be doing for a gazillion, more or less, more triangles! First of all, my blocks were worked on 31 stitches, so if you're going to follow what I did, you'll have to adjust your number if you didn't use 31 as your base. Secondly, you have to use a number that is divisible by 4, plus one 1 more stitch. I decided to go with 28 +1 stitch. Working with 29 stitches instead of 31 is close enough. Abbreviations: st-stitch; sl-slip; k-knit; k2tog-knit 2 together; psso-pass slipped stitch over; tbl-through the back of the loop. k3tog-knit 3 together. With the right side facing I picked up 15 stitches along each side of the diamond, to give me 30 sts. You can just k1 at the end if you prefer but I like the snug stitch it gives at the end of the row when you knit through the back of the loop. The k2tog in the middle tightens up the center stitch and makes the point sharper. Row 2 and all wrong side row to end of Row 12: Sl 1 purlwise, knit to the last st, k1 tbl. Row 14 (wrong side): K3tog. Fasten off. The random number generator chose number 1, who is Cyndi in BC. Cyndi, if you email me with your postal address I'll get the yarn and pattern off to you as soon as possible. Thanks to everyone who posted the new URL for my blog. It was frustrating to have the old URL taken away like it was and your help has been much appreciated. I wish I had prizes for all of you. 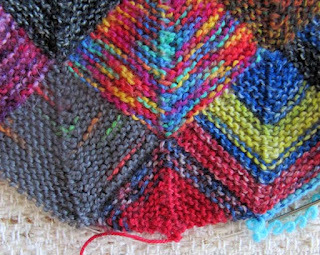 I'm approaching the end of knitting the little blocks for my Sock Yarn Afghan. I only have 12 left to go. The final tally will be 534 three-inch blocks and 8 larger ones. It's time to think about how I want to finish this. There are several options and the one I'm thinking about right now is to fill in the pointed edges, the Vs, with triangles all the way around to make a large rectangle. 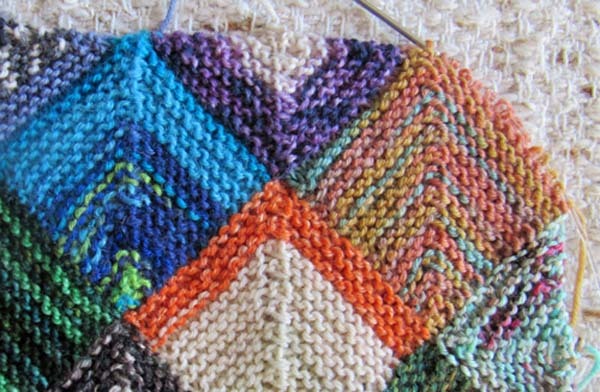 I would finish it off with a garter stitch border. I've been trying out differnt techniques on the side of the afghan to make the triangle but so far they have been messy and don't lie flat. 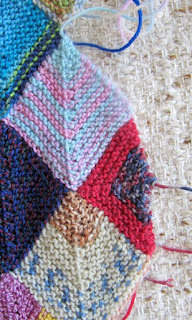 I still have a couple more ideas before I give up and go with a jagged edge afghan. 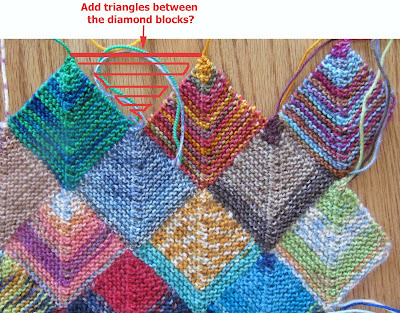 I have a feeling, although I haven't tried it out yet, that the top triangles might work out better. I'll give you an update after a bit more experimentation. I'm open to suggestions, by the way. I've designed a lot of patterns over the years, sold quite a few, too. Then, my day job and life got in the way and printing and mailing patterns to knitters became difficult. There weren't enough hours in the day. Now, with the ability to download patterns rather than waiting for the postman to bring them, I am preparing my patterns to put them up on Ravelry and Patternfish. There are already some available (even a couple of freebies!) and I will be adding more as they are ready. My goal is to have consistency, so I'll be putting all the patterns under the Rhythm of the Needles name and using the great artwork that Dennis did for me. I'm also hoping to add more photos. 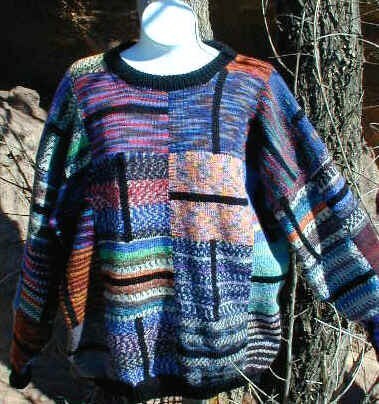 The one that I'm getting ready now is the Leftovers Sweater. 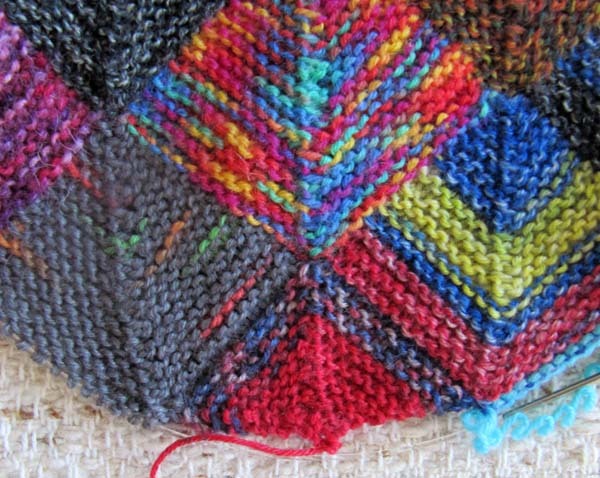 It's a design using up your ends of sock yarns, highlighted by bars of a complimentary color to "pull it all together", taking away from a scrappy look. The finished sizes range from 37" to 57". If you've ever made this sweater, I'd love to see a picture, and if you'll allow me, I'd like to post it. My plan is to have the Leftovers pattern available on Ravelry by the end of the month. 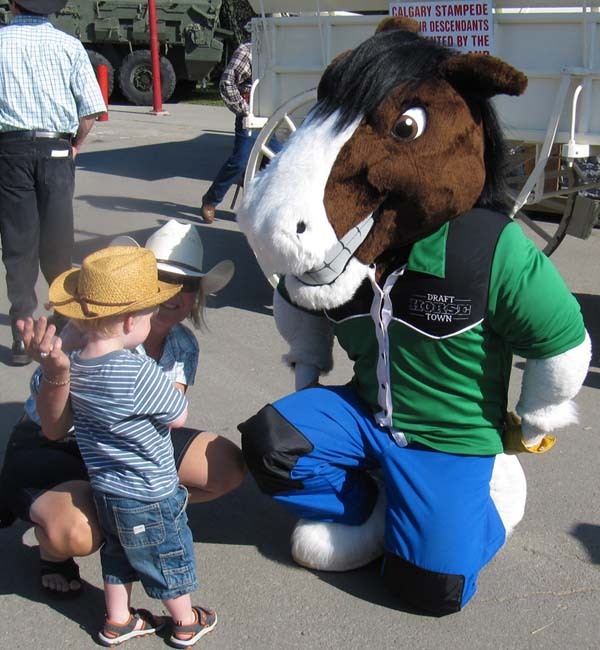 It's been Stampede Week here in Calgary and it's been a very successful year for the world's biggest rodeo. This year the Stampede turns 100. Added to that, the fact that the weather has been mostly perfect and you get record-breaking crowds. I didn't go to any of the rodeo events or musical stage shows. I did go to family day and wandered around some of the animal buildings, walked along the midway, ate greasy food and drank a large container of lemonade with a whole lemon inside. Braydon got to meet a horse, a Clydesdale, I think﻿﻿, judging by the furry feet. 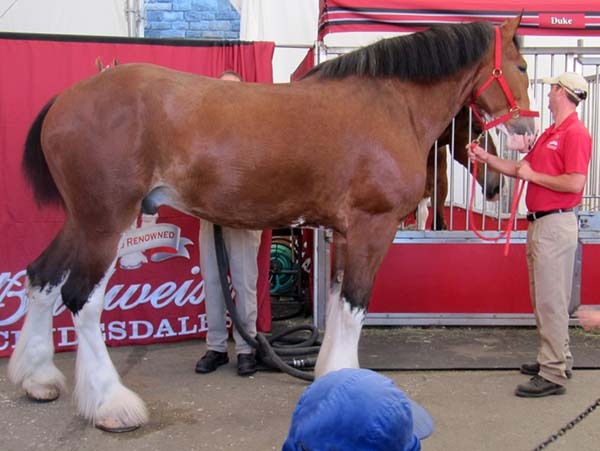 We saw many real Clydesdales. What large and magnificent horses they are. Look how high the back is in comparison to the height of the man who is holding the rein. What you can only see a little is that there is another man in behind who is cleaning the horse, with a vaccuum! It seemed like many things were on a grand scale, including this tractor. 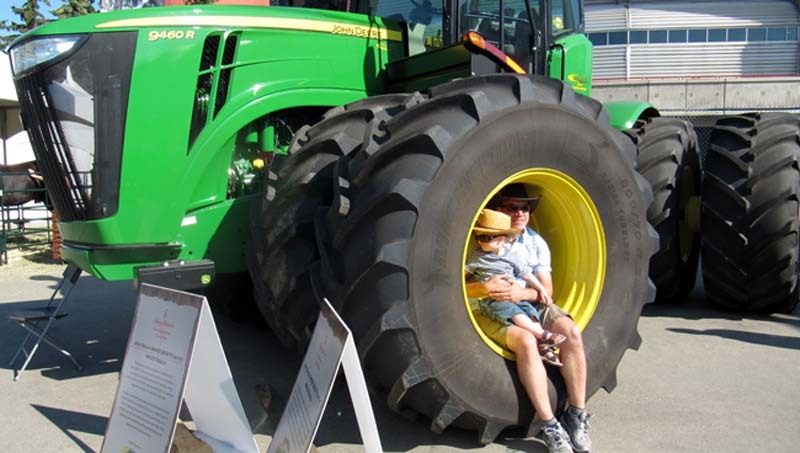 Drew and Braydon had to check it out, sitting inside one of the gigantic tires. Celebrations went beyond Stampede Park and for a week, it seems like everyone was a cowboy, cowgirl or cowkid. Cowkid? Is that a word? Some were authentic, some wannabees, but it was all good. We were allowed, encouraged, to wear jeans to work and there were many people who also wore cowboy hats and boots. On Tuesday the company I work for had a wonderful Stampede breakfast that went way beyond just pancakes, also including eggs, bacon, sausages, potatoes and beans as well as a live band. On Thursday we had our BBQ. The catering company brought along their huge barbecue and offered chicken, beef and pulled pork along with mashed potatoes and lots of salads, and more. Tomorrow, it's back to business attire and a sandwich for lunch. 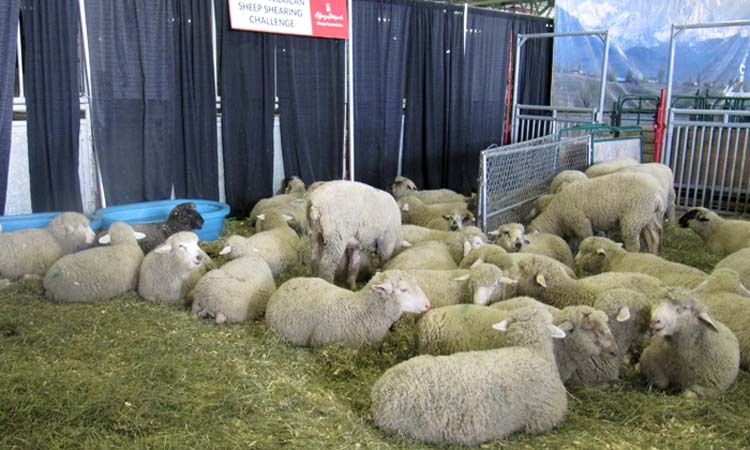 Knitting content: Of course there were sheep, including a black one, a.k.a. unfinished sweaters! * I'm having a Pink Floyd moment! It's been a while since I've had a contest. It's time for another one, don't you think? CONTEST ENTRY: If you put a link of my new URL on your blog, or mention my blog with it's new URL, you're entered. Alternately, you can leave the link on a Ravelry bulletin board or anywhere else that is viewable by a number of knitters. You'll have to send me an email or post a comment so that I can see where the URL is listed. THE PRIZE is a nice one: 8 balls of Sirdar Persia Chunky yarn, a beautiful blue / almost teal color, #0398. I don't see this color listed on the Sirdar website, so perhaps it's been discontinued, not sure. While you can make whatever you like with your yarn, should you win, I'll include a pattern that will work with this yarn. There is enough to make this single-colored cardigan up to a finished size 41.5" / 105cm. However, if you want to make it larger, you could always find a source for the contrasting colored yarn, buy 3 balls, and you'll have enough for a finished size 49.75" / 126 cm. Of course, you could use a different chunky yarn for the contrasting trim. DEADLINE: I will be choosing a winner at random from all entries and posting the winner's name on Wednesday, July 25th. Thanks for your help in getting the word out and GOOD LUCK! When I lived in the US I was able to access Google's American AND Canadian sites, as well as Google from other countries. Now that I'm in Canada I can't go to google.com. The page automatically switches to google.ca. It's a nice picture but not what I was looking for. I did a bit of research and learned that if you don't want Google to redirect you, type in the URL - http://www.google.com/ncr. NCR means "no country redirect". Now, I might have gone to the US Google site (but I'm not sure), but I still was not able to see the US picture. 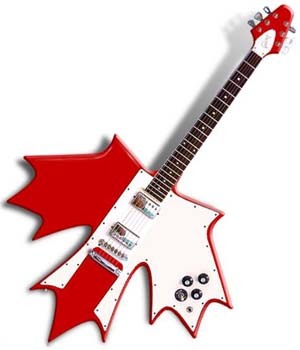 I still could only see the Canadian picture. I find this to be irritating and it feels like censorship. Why can't I visit the Google site of my choice without being redirected? It would be nice to have option to go where we want to go. If you're celebrating the Fourth of July, what are you doing today? 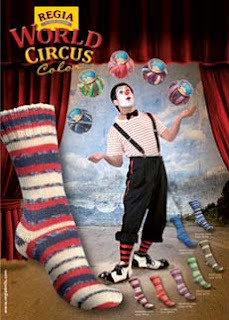 Me, I've cast on for a new pair of socks. 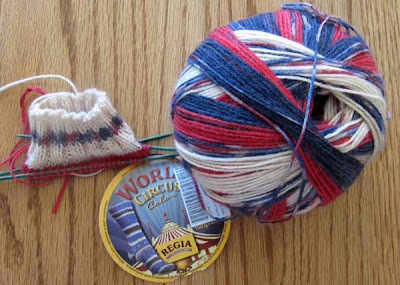 The yarn is from Regia and part of the World Circus colors. To me, it doesn't make me think of a circus. It looks patriotic. The color is #03754-Dompteur, the German word for Trainer. I've had the yarn for a couple of months but I bought it specifically for knitting a pair of socks, starting today. When I packed for my move I put away my Sock Yarn Blanket along with the sock yarns. Now, happily, I'm working on it again. This has been one of my favorite projects. Excuse the poor picture. Hopefully a better one will be coming before long. I have 490 small blocks and 8 large blocks done, which means it's about 87% finished, not counting the border. It's hard to believe that I'm only 44 small blocks from the end. That is, unless I decide to add little triangles around the edges to fill in between the pointy edges. Right now I'm leaning towards doing just that. Time will tell. I'm going to miss working on this afghan. That's one of the reasons that I started making another one in mainly pink yarns. Every now and then a knitting book comes along that you know that you'll be referring to often for techniques and inspiration. It promises to be well worn from use over the years. I now have a new book that falls into that category: "Cast On, Bind Off" by Leslie Ann Bestor. I thought I knew quite a few ways to cast on or bind off stithes, but it appears that I have many more to learn. Each technique is supported with text and excellent step-by-step photographs. I like the size of the book (5.5 x 7 inches) as it fits nicely into my knitting bag. It has a spiral binding so it'll lay flat while I try to manoever a new method. It's going to be a good reference and will help me decide which cast on I want to use: moebius, stretchy, double-sided, cable, chained or Old Norwegian, for example..... or choosing the best bind off: gathered, sloped, Icelandic or interlock, to name a few. 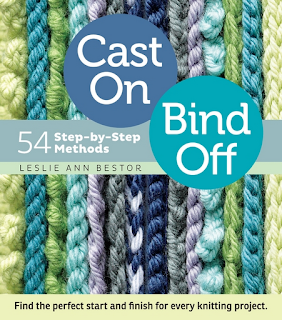 There are 33 cast-ons and 21 bind-offs in the book. Leslie Ann Bestor has offered a book I didn't know that I needed and now I wonder how I ever got by without it. The small bio on the back cover states that she is a knitting teacher and store manager at WEBS, a store that's on my must-visit list. I found an audio interview with Leslie Ann, click here. It I start to suffer from start-itis I can blame this book. "I was just trying out a new cast on!" "You Oughta Know", "Jagged Little Pill"
"Up On Cripple Creek", "The Night They Drove Old Dixie Down"
"Cuts Like a Knife", "Everything I Do, I Do It For You"
"American Woman", "No Sugar Tonight"
"Suzanne", "I'm Your Man", "Hallelujah"
"Heart of Gold", "Southern Man", "Powderfinger"
"How You Remind Me", "Rockstar"
"The Woman In Me", "You're Still The One"
"Born to be Wild" , "Magic Carpet Ride"